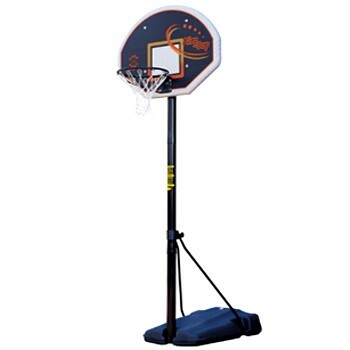 Heavy duty portable Steel Basketball Goal. Designed for school, Colleges and Leisure Centres. The upright is a heavy duty steel pole attached to a hollow wheelaway plastic base which needs to be filled with 210kg of sand or 130 litres of water to act as ballast. The polypropylene backboard is either fan shaped with graphics or rectangular. The ring is heavy duty steel. (NB: Not for slam dunking) supplied complete with net. For ease of movement the unit rolls on two wheels. For easy storage and to facilitate movement, the pole can be angled down. Approved by England Basketball, BBL, Basketball Scotland and Basketball Ireland. This heavy duty portable basketball unit benefits from Certificate EN 1270 (when used with full ballast). It will support 240kg (500lbs) of load on the goal – twice as much as any other portable system of this type on the market. Please note: This goal is sold per unit (not a pair).